After fleeing war-torn Europe and coming to America in 1941, Jean Renoir experienced mixed successes and increasing artistic frustration with the H ollywood studio system. By 1948 he was having difficulty finding financial backing for his films, but he finally managed to get funding from one-time-only producer Kenneth McEldowney to film Rumer Godden’s semi-autobiographical novel of her youthful experiences in Bengal, India, The River. 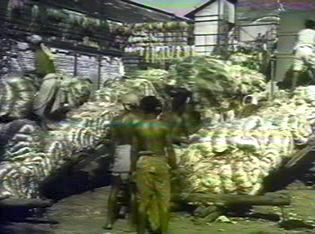 The resulting production of the film, which was released in 1951, was remarkable in several aspects. 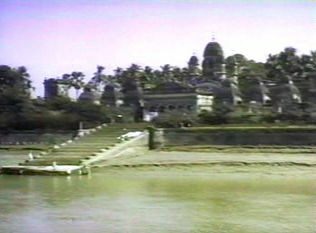 The film was shot on location in India, and it represented something of a landmark in the presentation of India on film to Western audiences. 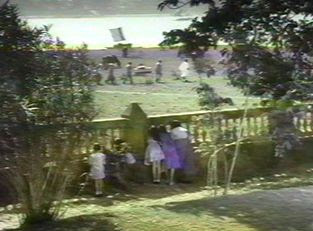 It was also Renoir’s first color film, and also the first color film to be shot in India. The Technicolor filming process was complicated and required significantly more artificial lighting than black-and-white films, so that shooting such a film outside the confines of the big studios represented a significant challenge. Godden’s stories had been film before, notably with Black Narcissus (1947), but on that occasion she had been unhappy with the alterations made to her original story by Powell and Pressburger. 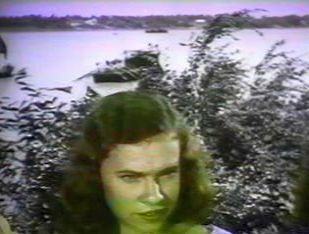 With The River (1951), she was engaged to co-script the film, and although significant changes were introduced in the story, the alterations were in accord with Godden’s original themes. Of no less importance, is the fact that the production of The River was instrumental in launching the careers of two youthful, first-time production assistants who later became seminal figures in Indian film history: writer-director Satyajit Ray and cinematographer Subrata Mitra. Over the years The River has been widely praised, but it has also been dismissed by just as many viewers as simply a mundane coming-of-age story about a teenage English girl and her first crush. Indeed most of the characters are European, and the Indian location merely seems to be a backdrop for some colorful location footage. Modern viewers might also be put off by the sympathetic presentation of privileged English colonialism. An additional drawback and perhaps even more of a hindrance to one’s viewing enjoyment is the very uneven and awkward dramatic performances of the amateur actors in the film. Presumably for budgetary reasons Renoir employed amateurs in many of the roles, and the timing of their dialo gue scenes is often wooden and artificial. Despite these glaring weaknesses, though, there is more to the film than first meets the eye. I have seen The River three times now, and on each occasion I have come to appreciate it more. What elevates the film for me is its philosophical character; and in this connection India is not just a backdrop, it is very much a thematic element of that narrative. The story is told by a mature narrator, a professional author, who is reflecting on her early experiences as a teenager. It is true that she was living a privileged life during the Raj, but the cultural influence of India and its Hindu practices shape the way she perceives many of the events around her. An interesting sidelight on this philosophical theme is that one of the principal characters in the film, the half-Indian girl Melanie, is played by Radha Burnier, who besides being a professional dancer was (and still is) a major figure in the Theosophical Society . Although the story seems very simple, there are a number of characters and some interesting narrative turns. The setting is a colonial estate in a village along one of the tributaries of the Ganges River in Bengal. There is no evident time period identified in the film, and when a war veteran (Captain John) appears, the viewer will probably naturally assume that reference i s being made to World War II. However, Rumer Godden was born in 1907, and given the autobiographical elements to the story, and the fact that the teenage protagonist, Harriet, is about fifteen years old, that reference is probably to the First World War. Anyway, the India shown here is timeless, so the precise dating doesn’t matter. 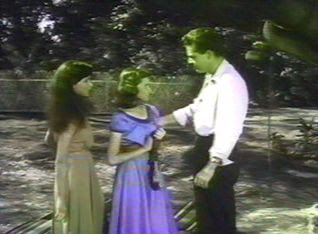 The focalization in the film throughout is seen through the eyes of the protagonist Harriet, who introduces the characters at the beginning of the story. She is the oldest of five sisters and has a young brother, Bogey, about seven. Her father manages a jute mill, and her mother is pregnant, expecting another child. There are some Indian servants, including a nanny who looks after all the children and a stern Sikh doorman who guards the front gate of the estate. Their widowed neighbour, Mr. John, had an Indian wife, and early on in the film, his daughter, Melanie, returns home from boarding school after a long absence. Harriet has a close friend, Valerie, who is the daughter of the owner of the jute mill (never seen) and who, at about eighteen years of age, is perhaps a bit younger than Melanie. Soon the lives of the three teenage girls are enlivened by the announcement that Mr. John’s American cousin and war veteran, Captain John, is coming for an extended visit. When he meets Captain John, Harriet’s father graciously offers that “if you stay long enough, . . . we’ll get you a shot at a tiger”. Such were the days of the British Raj. With the introductions out of the way, the visual metaphors come into focus. The ordered, cloistered life inside the estate walls is surrounded by the exotic outside world of India – a world that is ccrweded, complicated, and full of mysterious things. Thus there is a striking visual contrast between the familiar patterns of our everyday world and the mysteries lying in wait just beyond those borders. The recollecting narrator recalls how fascinating the village life was and the way it mixed so many different patterns of life. The sacred river is the unifying image of this world, literally and metaphorically. It brings so many people together along its banks and it symbolized the endless flow of life and death. But there is also one element from this exotic world that exists inside the estate compound – an enormous pipal (banyan) tree. These often huge, complicated trees, with their branches that can drop down to the ground and take root, are almost forests in themselves. It, too, represents the disorderliness of the exotic and unknown outside world. Bogey spends his time with a native Indian mate exploring the corners and shadows of this forest area and trying to be its master. Harriet and Valerie are both quickly smitten by the attractive Captain John. He is invited over to the estate to celebrate the traditional Indian Diwali festival of light. Captain John, however, has not come to India for romance, but to run away from the traumas associated with his having lost a leg in the war, and he walks with an artificial limb. He is now a lost wanderer, unable to come to grips with the fact that he is diminished and not a normal man. Melanie is attracted to Captain John, too, but has her own issues. As a mixed-breed individual, she feels that she doesn’t belong to any society. In Indian society she is casteless and therefore at the bottom. In Western society (this was back in the period when white racism was rampant), she is seen as “black”. Despite her culture and beauty, she feels that she doesn’t belong anywhere. Conflicts now begin to erupt. Valerie exposes Harriet’s secret diary, with its romantic descriptions of Captain John, to the man they both desire. But Valerie’s aggressiveness backfires when her sporting challenge to Captain John makes him fall, reminding him of his disability and souring their relationship. 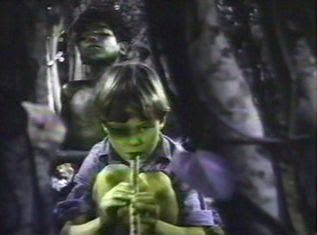 Meanwhile Bogey, pursuing his obsession to emulate a snake charmer he had seen in the village, locates a cobra hiding in the pipal tree and tries to charm it with his flute. All three girls have their own romantic longings for Captain John, and various tentative encounters take place that are blocked by self doubts and social inhibitions. Although Captain John seems genuinely attracted to Melanie, it is the aggressive Valerie who succeeds in forcing the issue and invoking a romantic embrace in the forested estate garden. At the end of this section, only frustration prevails. Melanie and Harriet are crushed to witness Captain John kissing Valerie. Valerie, herself, is disappointed that expectation exceeded the fulfilment. And then Bogey is found dead in the garden from a snake bite. After the sad and moving funeral for Bogey, everyone is melancholy. Captain John and Melanie have a heartfelt talk about life, and Melanie asserts that the only solution is to consent to what is. Captain John resists such passivity and affirms his refusal to accept a diminished role for himself. Harriet, who had known about Bogey’s snake-charmer obsession, blames herself and decides to end her life. She hires a boat at night, floats in it down the sacred river, and then jumps overboard. But local fishermen rescue her, and Captain John goes out to the dock to meet her. When they talk, they both accept that they can still live fully within the bounds that life has set for them. Bogey wants to conquer the world in the fashion of his imperialist forbears. 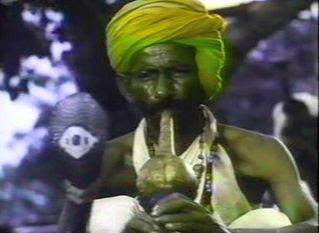 He is confident that he can master the snake-charming technique and gain control of the cobra. Valerie is narcissistic and self-confident. The world revolves around her, and she wants to grab whatever she can for her own self-indulgent pleasures. Captain John doesn’t want to accept what he must: the unavoidable restrictions imposed on him by the physical world. Melanie is an outsider, but feels she can do nothing but “consent” to what the world has dictated to her. But these restrictions are socially-imposed by ignorance and not by physics – they should be resisted. Harriet is the dreamy idealist who wishes that everyone could be Krishna or Radha and live in perfect harmony. In addition to the many atmospheric shots of Indian life, both ritual and practical, on and along the river, there are three scenes in the film that stand out for me and resonate long after the film is over. All of them relate to and reinforce the principal theme of embracing the wonder of ever-changing life – swimming in the river. [2nd section] Harriet’s eight-minute visualized story that she tells to Captain John and Valerie. An imagined young girl resists her father’s arranged-marriage demands, but on the wedding day, the chosen groom magically turns into the god Krishna – and she, herself, becomes his consort, Radha. Afterwards the married couple resume their identities and live a happily married life. [3rd section] Harriet, Valerie, and Melanie are in the forested garden of the estate in section three, looking for Captain John. This is also an eight-minute sequence, and it interweaves the perspective and frustrated yearnings of all those characters. [4th section] Mr. John’s brief soliloquy after Bogey’s death on the beauty and wonders of childhood. It is children, he says, who really engage the world the way it should be engaged. They see the wondrous nature that has become faint and less visible to us adults, and he celebrates the vivid, authentic life that Bogey had led. Radha Burnier was an associate of Jiddu Krishnamurti and had a long career as a leader, organizer, and author in the Theosophical Society Adyar (the original Theosophical Society). http://en.wikipedia.org/wiki/Radha_Burnier.